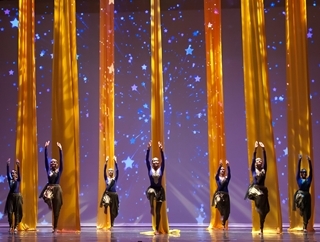 Kruti Dance Academy celebrated its 20th year in Atlanta with an amazing dance performance at the Cobb Energy Performing Arts Centre on May 24, 2015. This year the theme was “Chamatkaar” (miracle). The sold-out, three hours show was packed with unparalleled exuberant and high octane extravaganza of color, costumes, backdrops, and intricate choreography—a spectacle fitting for the dance academy’s artistic and culturally infused twenty-year magical journey. The show’s multiple segments had imaginatively conceived and creatively choreographed classical Bharatanatyam, Bollywood, and fusion dances. The well-designed choreography created an aura of magic, mesmerizing the audience from start to finish. The stage was a gushing fountain of dazzling multi-hued costumes, accessories, choicest chart-buster songs, and a wide range of pulsating music of a blend of musical instruments, embellished with captivating stage décor, distinctive props, and visually stunning backdrops. Kruti’s well-trained students and alumni of diverse nationalities and age groups danced with joie-de-vivre and a lot of heart in presenting an unforgettable spectacle, comparable to a Broadway show experience. In the hypnotic dance Maya (photo at top of page), Kruti’s advanced students performed intricate geometric patterns with precision and poise to the steady throbbing drumbeats. In Om Namah Shivaya (above), the blowing of the conch and weaving of colorful ribbons presented an artistic interpretation of Lord Shiva’s magnificent form. The audience was totally immersed in this dazzling dance. In Moksha (left), the choreography seamlessly fused intricate Bharatanatyam movement with spellbinding aerial dance. This item was performed by senior Bharatanatyam dancers of the academy, and the audience watched in awe and with pin drop silence. And Tu Meri (below), an energetic hip hop-inspired Bollywood number, was performed by the dance academy’s senior boys. The power and finesse in their movements set the stage on fire, and the audience responded with thunderous applause.